MATTHEW: (Levi—priest tribe –Matt. 9:9) A Publican (tax collector –Luke 5:27). Son of Alphaeus (Mark 2:14). One of the twelve apostles (Matt. 10:3). MARK: (John) Cousin to Barnabas of Cyprus. Son of Mary of Jerusalem (Acts 23:16). Convert of Peter (1Pet. 5:13). Taken to Antioch by Paul and Barnabas after death of James (brother of John) after Peter's escape (Ac. 12:12, 25). 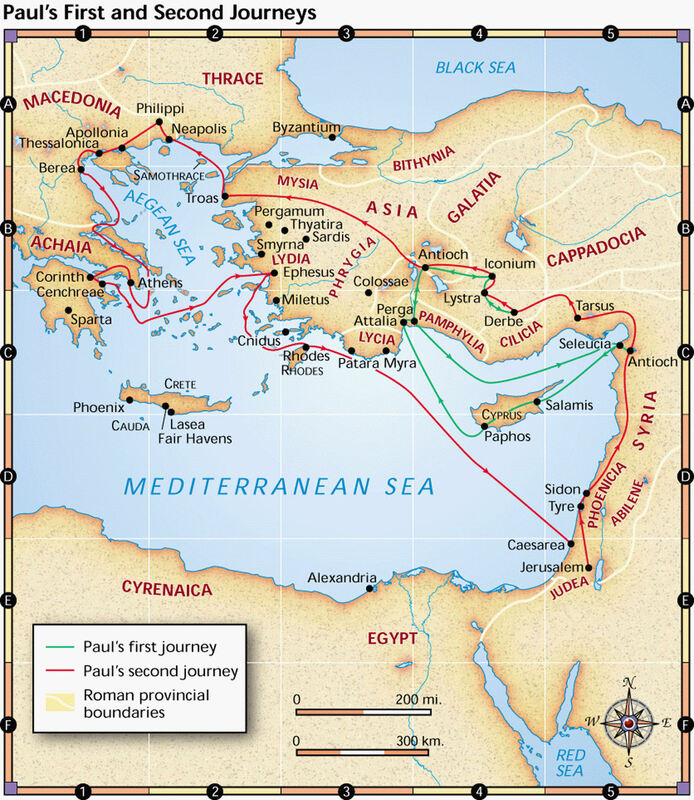 Accompanied Paul and Barnabas on first missionary journey through Cyprus, the homeland of Barnabas (Ac. 13:5). Turned back to Jerusalem at Perga (coast of Turkey) (Ac. 13:13). After the conference at Jerusalem (Acts 15) he returned to Antioch with Paul and Barnabas. Paul refused to take him on second missionary journey. He went with Barnabas to Cyprus while Paul took Silas to churches in Asia (Ac. 15:37-39). In later years he was with Paul at various times (Col. 4:10; Philemon 1:24). Paul said he was "profitable" to him (2Tim. 4:11). Peter calls him, "my son" (1Pet. 5:13). LUKE: “The beloved physician” (Col. 4:14). Probably a Greek from Philippi. Traveled with Paul (Philemon 1:24; 2Tim. 4:11). Travels in Acts indicated by "we." Wrote Gospel of Luke and Acts, to Theophilus. JOHN: Brother James was killed by Herod (Acts 12:1-2). Son of Zebedee (Matt. 4:21). Mother was Salome. He and James were called, “Sons of Thunder” (Mark 3:17) Called by Jesus from business as fishermen (Matt. 4:21-22). Wanted to call fire down from heaven on a city of Samaritans (Luke 9:54). Forbade a man from casting out demons (Luke 9:49). His mother wanted him to sit next to Jesus in the kingdom (Matt. 20:20-21). Paul said that he seemed to be one of the “pillars” of the church (Gal. 2:9). Last mentioned in exile on the Island of Patmos (Rev. 1:9). Was one of the twelve Apostles (Matt. 10:2). PAUL: (Saul of Tarsus –Acts 9:11; 22:3) A Jew (Ac. 22:3), of the tribe of Benjamin (Rom. 11:1; Phi. 3:5). Roman citizen by birth (Acts 22:25-28). Unmarried (1Cor. 9:5). Studied at the feet of Gamaliel (Acts 22;3). Held the cloaks of those who stoned Stephen (Acts 7:58; 22:20). Converted by the vision of Christ on road to Damascus (Acts 9:1-7; 22:6-10; Acts 26:12-16). Blind three days (Acts 9:8-9: 22:11). Told by Ananias to arise and be baptized and wash away his sins (Acts 22:16). Went to Arabia and returned to Damascus (Gal. 1:17). After three years went to Jerusalem and was take by Barnabas to see Peter and James (Gal. 1:18-19; Acts 9:26-27). He then went to Tarsus (Acts 9:30). Barnabas later brought him to Antioch to help in the church there (Acts 11:25-26). They visited Jerusalem with an offering for the poor (Acts 11:27-30). He and Barnabas returned to Antioch with John Mark (Acts 12:25). Sent with Barnabas and Mark to Cyprus and to Asian mainland where Mark turned back (Acts 13:13). Stoned and left for dead at Lystra (Acts 14:19). Returned to Antioch (Acts 14:26). Went to Jerusalem concerning dispute over whether Gentiles must be circumcised (Acts 15:1-2). Returning to Antioch (Acts 15:30), they determined to again visit the churches (Acts 15:35-36) but Paul refused to take Mark (Acts 15:37-38). Paul and Barnabas split up and Paul took Silas to the churches on the Asian mainland (now, Turkey) Acts 15:40-41. At Lystra, Timothy was circumcised and joined them (Acts 16:1-8). They continued west across Asia through Phrygia and Galatia to Mysia and on to Troas on the coast of the Agean Sea (Acts 16:8). They received a call to come over into Macedonia. They sailed to Samothracia and then Neapolis. They arrived in Macedonia at Philippi where he met Lyddia (Acts 16:14) and later was jailed for casting a demon out of a woman (Acts 16:23). When released they went to Thessalonica where he received a hostile treatment (Acts 17:1). He then traveled to Berea where he was received well (Acts 17:10). From there he went to Athens where his preaching on Mars Hill was rejected (Acts 17:15). He then went to Corinth where he continued a year and six months, starting the church (Acts 18:11). 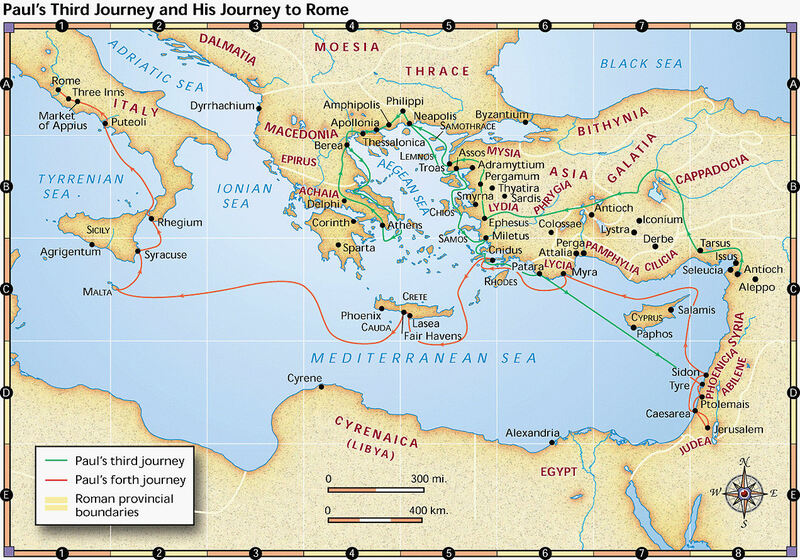 He then sailed to Ephesus (Acts 18:1) and then on to Caesarea and back to Antioch. Paul then went into Galatia and Phrygia, strengthening the disciples (Acts 18:23). He next appears at Ephesus (Acts 19:1) where he baptizes twelve disciples of John. He then disputes in the school of Tyrannus for two years (Acts 19:10). After a riot, instigated by Demetrius the silversmith, he sailed to Macedonia (Acts 20:1) and then on to Greece (Acts 20:2). He sailed to Troas where he met with the disciples for the Lord's supper and preached (Acts 20:6-7). Paul met the ship at Asos and they sailed to Mitylene, Samos, Trogyllium and Miletus (Acts 20:14-15) where he called for the elders of Ephesus to speak with him (Acts 20:17). He then sailed to Coos, Rhodes, Patara and then to Tyre (Acts 21:1-3). They then went on to Ptolemais, Caesarea (Acts 21:7-8) and then to Jerusalem (Acts 21:15). At Jerusalem Paul was taken prisoner (Acts 21:27, 33). He addressed the people from the stairs of the castle (Acts 22:1). He addressed the Jewish Council (Acts 23:1). He is sent to Caesarea by night because of a plot to kill him (Acts 23:23). He gets a hearing before Felix, the governor but stays in custody for two years (Acts 24). He gets a hearing before Festus, the governor and appeals to Caesar (Acts 25:1-12). He receives a hearing before King Agrippa (Acts 26). Paul is sent to Italy and on the way is shipwrecked (Acts 27-28). Paul wrote Romans through Philemon and reputedly, Hebrews. JAMES: The “brother of the Lord.” Called an apostle (Gal. 1:18, 19; Ac. 9:27, 28). Was regarded as a “pillar” of the church (Gal. 2:9). Probably brother of Jude in Mark 6:3. Wrote: I & II Peter. JUDE: Brother of James. Probably the Judas mentioned in Mark. 6:3 as the Lord's brother. Wrote the book of Jude.